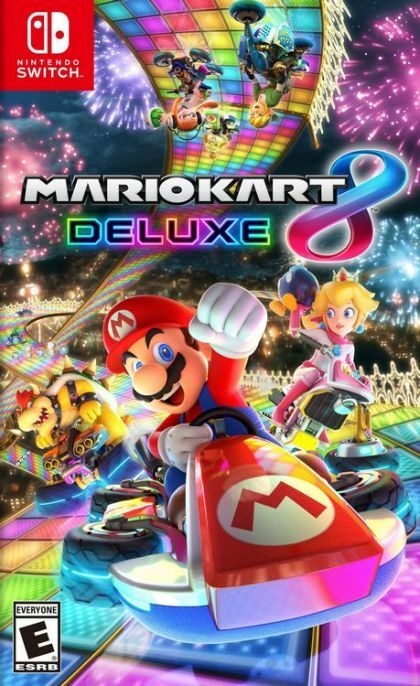 With Nintendo Switch, fans can enjoy the definitive version of Mario Kart 8 anywhere, anytime, even with up to eight friends in local wireless multiplayer. All your favourite tracks and characters return from the Wii U version, plus all DLC tracks and characters, and new characters join the roster, too: Inkling Boy and Inkling Girl from Splatoon, King Boo, Dry Bones, and Bowser Jr.! Plus, battle mode has been revamped and includes Balloon Battle and Bob-omb Blast, with all-new courses such as Urchin Underpass and Battle Stadium, and returning ones like (GCN) Luigi's Mansion and (SNES) Battle Course 1 from Super Mario Kart on the Super Nintendo Entertainment System.